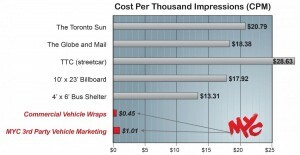 There have been many studies done to identify the effectiveness of outdoor vehicle advertising. The consensus of the majority of studies is that vehicle advertising is one the most effective and lowest cost advertising mediums available. Studies estimate that vehicle wraps can garner as many as 30,000 to 70,000 daily impressions. It is easy to see the low CPM for vehicle wraps in the graph below which illustrates the CPM for various advertising mediums. Not only is vehicle advertising relatively inexpensive but it also has a high recall value. With 97 % of people remembering fleet graphics it is one of the best tools to incorporate into a companies media strategy. 98% of people think wraps create a positive image of the advertiser. The additional benefit of vehicle wraps, decals and fleet graphics is that they unify a fleet or company image. In addition to 98% of people thinking it creates a positive company image. It can help the fleet look newer by wrapping old vehicles, cleaner, and more professional. 96% of people think fleet graphics have more impact then billboards. 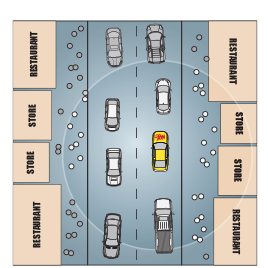 The probable reason 96% of people think wraps have more impact then billboards is because they are easier seen. They are right there in front and beside drivers, and not 100 feet out and 50 feet in the air. CPM stands for Cost per Thousand Impressions. It is a industry standard unit of measure which defines how many dollars it costs to run an advertisement to receive 1000 impressions. Vehicle advertising is when an advertisement is placed on a vehicle. They can be in the forms of car wraps, bus wraps, van wraps, truck wraps, trailer wraps and virtually any other type of vehicle wrap. While full vehicle wraps are the most effective when designed and wrapped properly, simple decals or partial wraps can qualify as vehicle advertisements and can also be very effective. A wrap or vehicle wrap is the outcome of printing graphics on a adhesive backed vinyl product and installing them on a vehicle. People call this many things such as skirt, shrink wrap, condom, etc. The industry standard terms are Vehicle wrap, truck wraps, trailer wrap, etc. We have included some links below to resources which outline the benefits and effectiveness of vehicle advertising for your convenience.